In the late 1960’s in America, most states still enforced laws that made it illegal for a black person to drink from the same water fountain as a white person. Not all Americans embraced this way of thinking, however. Men like Matt Drayton (played by David Lundgren), publisher of a San Francisco newspaper, made a point to show biracial couples on the front page of his newspaper. Despite his progressive views on integration in America, Matt struggles when his white daughter comes home from her internship with quite a surprise: a black fiancé. 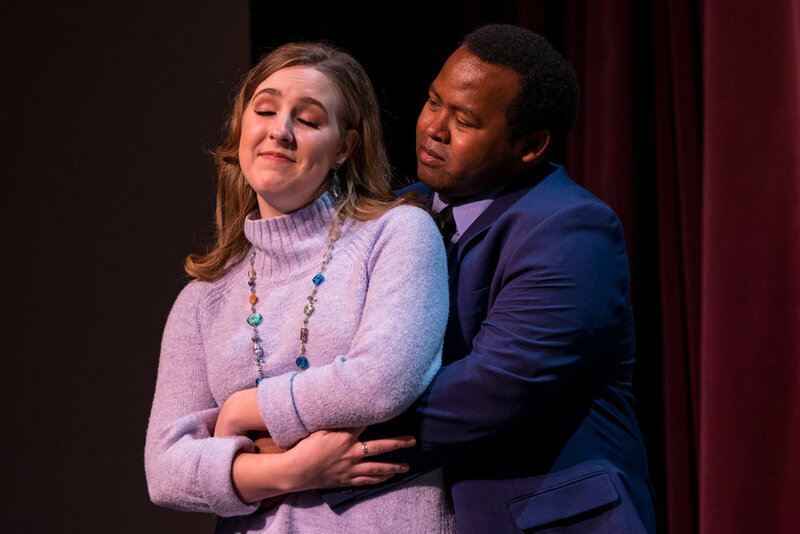 His daughter, Joanna Drayton (played by Megan Christoferson), assures her fiancé, Dr. John Prentice (played by Ontoni Reedy), that her parents will love him. After all, she says, "My parents love surprises. Surprises make them listen." She did not account for the initial shock and outrage that her parents would display. 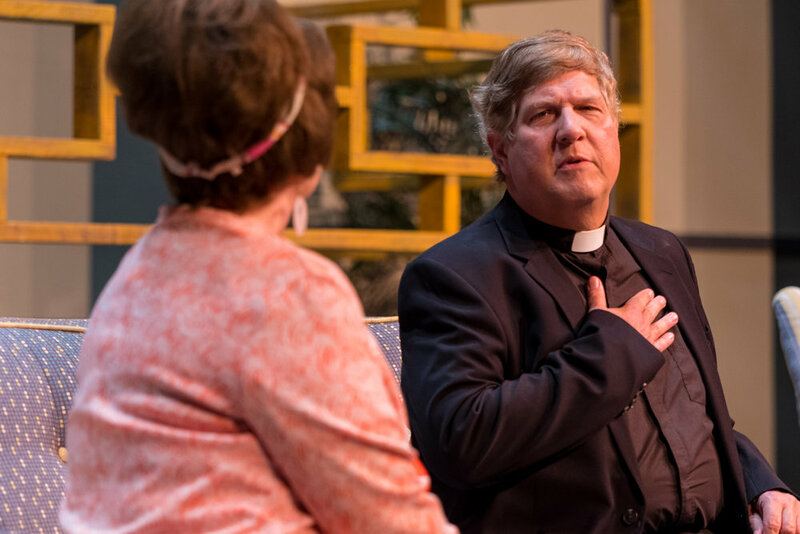 Monsignor Ryan (played by Lanny Poteet) reminds Matt that if his daughter had come home engaged to a successful, renown, white doctor, he would have celebrated. So why is he reluctant to give his daughter his blessing simply because her fiancé has black skin? Matt and his wife have prided themselves on being a progressive-minded couple. Now they must respond as their liberal ideals clash with their personal reality. Will they give their "outrageously optimistic" daughter their blessing? 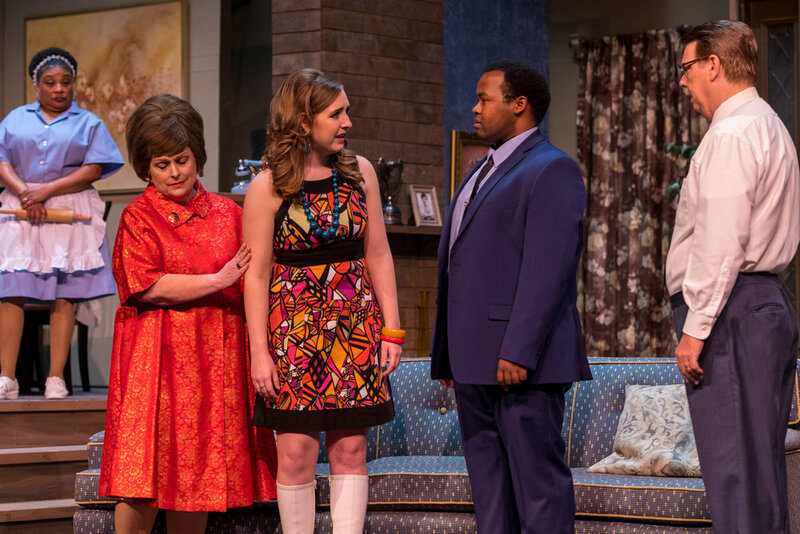 In a play set in the 1960’s, the theme of racial tension and the need for honest communication are just as relevant today. Though the dialogue tends to be overly didactic, Guess Who’s Coming to Dinner? effectively helps us as an audience see the foolish way we often respond to people of a different skin color than our own. Best delivery of dialogue goes to Sally Dickerson who plays Matilda "Tillie" Binks. She works as domestic help for the family and is often in the background of the scenes, busily preparing the dinner table and observing everything that goes on in the household. And she's prone to giving a hearty "mmmhmm" as conversations take place. 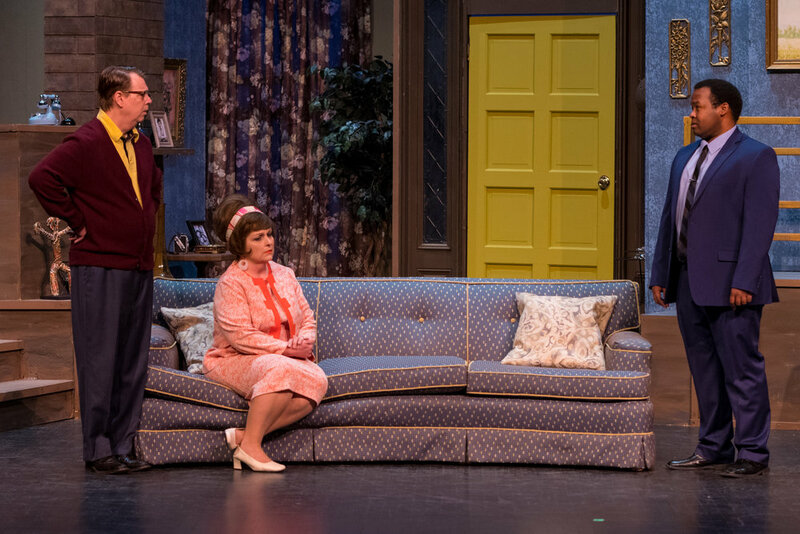 The set itself is a work of 1960’s magic. It spans the length of the stage, allowing characters to seamlessly move from the terrace to the living room, kitchen, study, and even upstairs. Great attention to detail was given to the mantel, brickwork, and stair railing in particular. With just a glance at the couch and wallpaper, the audience immediately knows both the decade and the social standing of this family. Every family needs to have these conversations in their home—but not every family needs to see this play. The characters are prone to cursing, but each helps us find a mirror into our own life and reflect on how we respond to people who look different than ourselves. Guess Who’s Coming to Dinner? is running April 4-7 at The Ned. Purchase tickets at the Jackson Theatre Guild website. After graduating from Union University, Renae Adelsberger and her husband Kevin decided to make Jackson their home due to their love for their church, nonprofits, local businesses, and abundance of Sonic drive-ins. Read more of her work on her personal blog. Photographer Kevin Adelsberger and his wife Renae moved to Jackson for college (proud Union alumni) and have stayed every since. Jackson has since taken hold of Kevin’s heart, and he looks forward to continuing to grow with the city. Kevin opened Adelsberger Marketing in 2014 and saw working with Our Jackson Home as a way that he could serve the city he loves. Kevin and Renae are members of First Baptist Church and volunteer with the youth group there and with Madison County CASA.